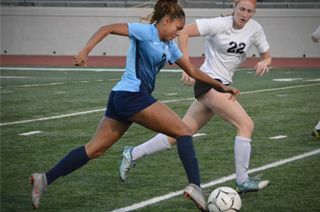 Immaculate Heart High School's Varsity Soccer Team will compete in CIF Southern Section playoffs after winning first place in the Sunshine League. On Wednesday, January 30, the varsity team triumphed over Notre Dame Academy in a 3-0 game to win the title of Sunshine League Champion—the first time in over 15 years that a soccer team has claimed that prize! Even before their championship victory, the game was already a momentous one for the team, as it was the final game in their regular season. To celebrate the occasion, IH Athletic Director Maureen Rodriguez took time before the game to honor the senior athletes on the team, including team captains Olivia Katz, Ella Tetrault and Riley Younger, players Stella Bushkin and Eva Jones, and managers Eli Brown and Talia Biery. 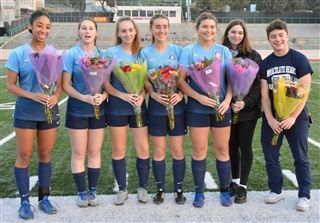 The seniors were applauded by their teammates, their coach, and by Immaculate Heart Middle School’s soccer team, members of which had come to root for their older “Panda sisters” as they faced NDA. Following their fantastic season, during which the team only gave up two goals, the team will advance to CIF Southern Section playoffs.